• This is one of a few articles I published elsewhere before Green Path was conceived or begun but is still relevant enough to deserve a place on the blog. The date-stamp will say 2010, the date of first publication, although the review was only added to GP in 2016. Nicolas Rothwell has been reporting from the North for many years now, covering the vast territory from Cairns, Cape York and the Pilbara down into the Centre. His articles and the journeys behind them are the source of four books which probably belong on the ‘travel’ shelf – Another Country, Wings of the Kite-Hawk, The Red Highway, and now Journeys to the Interior. They are not simply travel books, however, but poetic ruminations on people and places, his own inner voyage, and ways of understanding an environment which is profoundly strange to anyone brought up with a European sensibility. Journeys seems closer to its journalistic origins than its predecessors. 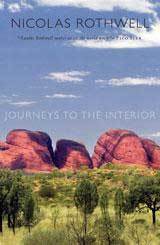 A trio of long essays sets the scene, but the bulk of the book consists of individual portraits of indigenous artists and community leaders, white explorers and naturalists, and significant locations. Each reads well but they don’t cohere into a single story. Then again, that is one of Rothwell’s themes: he has come to believe that this landscape resists our Western attempts to impose narrative upon it and can only be known through scattered fragments. Another recurrent theme is a resonance between this ancient, worn-down country and a Western civilisation he feels is in terminal decay; it gives his work a pervasively melancholic cast which is the opposite of the typical bright, breezy travel book. For all that, he makes a valuable contribution to our knowledge of a region that is foreign to most Australians – even to most Townsvilleans, although we live on the edge of it.